This project was realized with Proboter GmbH. Develop an innovative concept of gripping system for mobile robots in warehouse application. Two arm gripper configuration using a parallelogram mechanism, able to keep the parallelism between each arm in any state and grasp in an adaptive way. 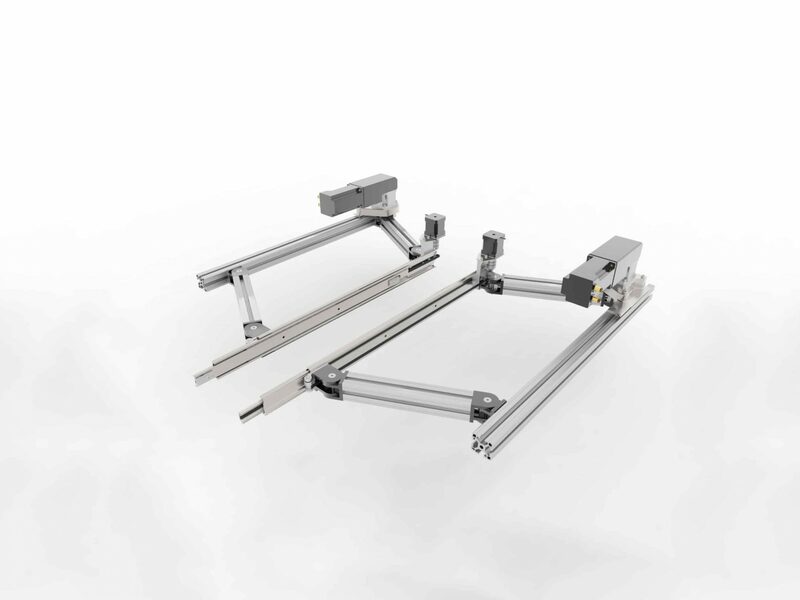 The use of three steps slider rails with integrated belt system as compared to standard linear actuators allowed for ~20% further range while keeping the same occupancy in closed state. The use of such parallel configuration allow to have a longer fixed zone of the gripper than standard linear XY actuators and allow for increased resistance to torsion due to vertical forces, allowing for larger payloads. The design was aimed for fast iteration cycle using Stepper motors with a maximum allowable payload of 6.62kg, and adaptable to brushless DC Motors for a maximum allowable payload of 19.86kg.